From the artist: In late spring, the Art in the Loop Foundation commissioned me, among many other artists, to create temporary work for the series of summer programming in downtown Kansas City titled Connect. With the opportunity to partner with the KC Streetcar Authority during the streetcar’s inaugural year, a mural on one of the station stops seemed a clear choice. I See You was installed mid-July at the northbound Power & Light stop near 14th & Main. Since I have been itching to do more of what I call “lace portraiture,” another clear choice was before me. This piece graphically fused the nature of lace – domestic, intimate, soft – with the metaphor I see in the material of many individuals strands creating an interconnected network. In I See You, the overlapping strands of cursive text radiate out to create the profile of a figure, a self-portrait, in truth. Yet, this is portraiture not beholden to capturing the physical likeness. Rather, it captures thought, consciousness, a meditation, or at the very least, that is my intent. I invite you to visit the Art in the Loop’s website to listen to a short clip where I spoke about the meaning of this piece during the opening reception. The description I gave there is a bit different than what I have shared anywhere else and something I felt best shared through voice. This work references a series of drawings created from the desire to transcribe consciousness into visual form. One never knows how a work will be received and I am grateful that this piece seems to be appreciated. Along with Don Wilkison‘s project, aka m.o.i., (Minister of Information), I See You was featured on KCUR’s website. The Shawnee Mission Post also featured the work. The transparency of the mural overlays a lacy filter onto the downtown surroundings at the northbound Power & Light Streetcar stop near 14th & Main St. The layers of handwritten text were printed onto a clear adhesive vinyl. While individual words can be picked out here and there, overall, the layers render the sentences illegible. A graphic mass of thought is the result. While this work is temporary, up through September, I will have the opportunity to share more lace portraiture through an upcoming project called Femin Is. This launched softly on KC Art Pie, with a hard launch including a Kickstarter campaign coming in October (sign up for updates here). So, more lace, or at least my interpretation of it, is on the way. Until then, you can join me on the 17th for an Art on the Route tour hosted by ArtsKC and the Kansas City Artists Coalition. Otherwise, you have until the end of September to view I See You as well as all the other works on the line. Then it will be like what remains of our summer: going, going, gone. The Chamber of Commerce in my area did a piece on my work in the local Prairie Village Post. Simply scroll down to read the article, or you can view it on the publication’s website. 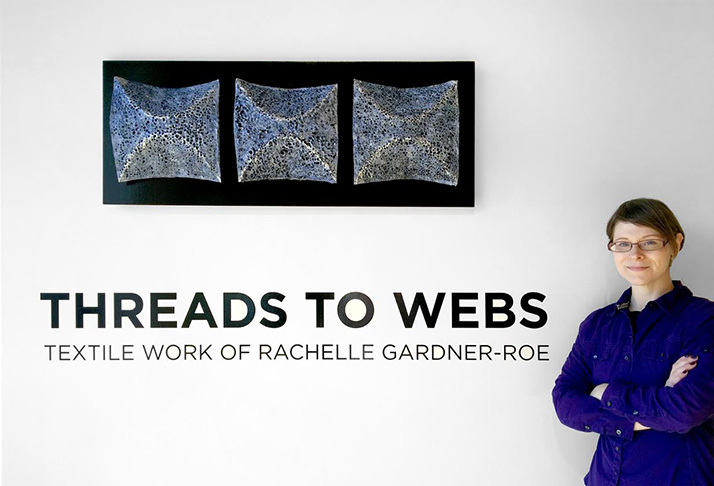 The recent exhibition of Gardner-Roe’s work at the ArtsKC Regional Council emphasized the textile connections that can be found throughout the artist’s mixed media work. At the age of 5, if you had asked Rachelle Gardner-Roe what she wanted to be when she grew up, the answer would have been a no-brainer: an artist. We all wanted to be lots of things at the age of 5, but despite the twists and turns of life, Gardner-Roe managed to hold onto her dream. That design-build experience also helped her land her first job out of college, designing and building custom furniture at a woodshop. Still, the 5 year old inside wouldn’t stay quiet for long. The artist has spent the last ten years fusing that foundation in design with a unique vision to cross boundaries in media. Whether it’s a 12 foot drawing of Alice in Wonderland-like vegetation, a ceramic vessel fired in a dug-out pit at the family farm, or her most recent blending of fabric and resin to create lace sculpture, Gardner-Roe puts her training and her imagination to the test. 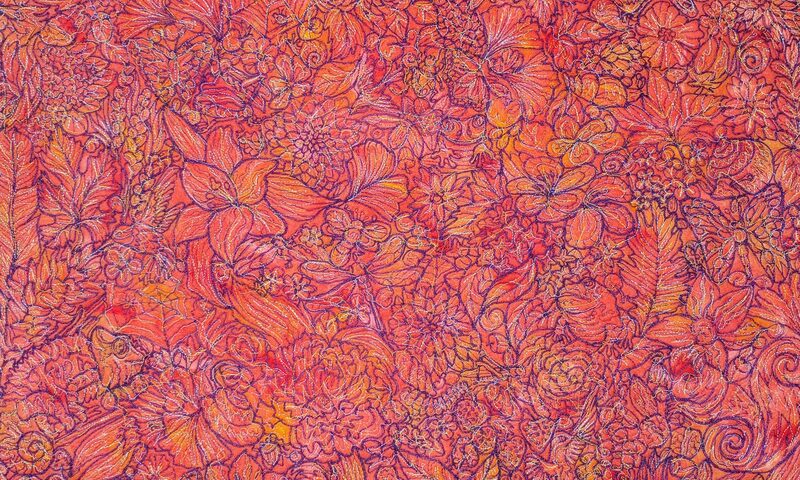 While she works in media including resin, ceramics, drawing, and painting, a textile element can almost always be found. Influenced by the passing down of handcraft through the generations, she strives to re-contextualize traditional craft. Her efforts have not gone unnoticed. During her career in Kansas City, she has been awarded a studio residency from the Charlotte Street Foundation as well as multiple grants from the ArtsKC Regional Arts Council. In the last few years, she received a scholarship to study experimental sculpture near Aspen, Colorado as well as a research and development residency in the panhandle of Florida. Her work has been in exhibitions across the country from San Jose, California to Lowell, Massachusetts. While you might expect a burgeoning artist to seek out hotspots like New York City and Los Angeles, Gardner-Roe is dedicated to the arts scene in Kansas City. Just this fall, the artist exhibited a solo exhibition at one of those organizations, the ArtsKC Regional Council in the heart of the Crossroads Arts District and has just released an online exhibition catalogue. 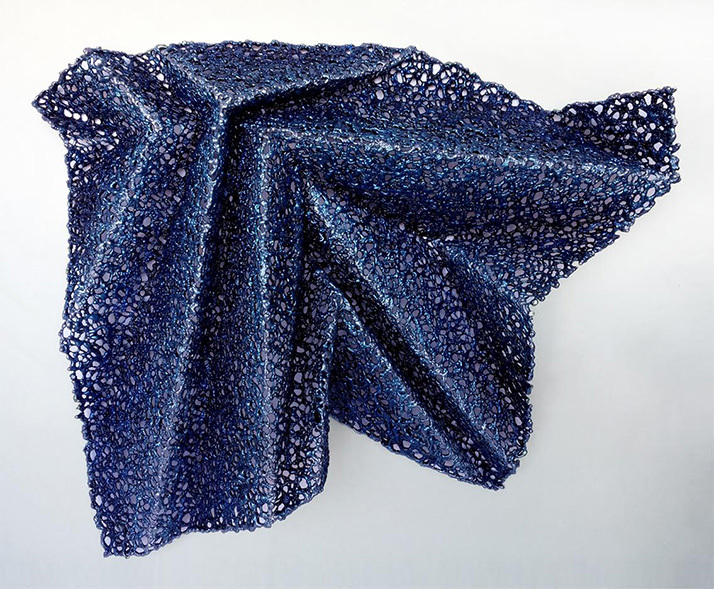 The artist currently splits her time between her home in Mission and the family farm where she works on her fabric sculpture, which lace can appear frozen in undulating curves or precise origami-like folds. Gardner-Roe occasionally pauses to focus on other bodies of work, but she has been building on this unique style of sculpture for several years. The artist’s experimental approach to materials results in unique lace sculpture such as Rhythm No. 2A, which combines ideas regarding memory with research in the design principles behind the art of paper folding. 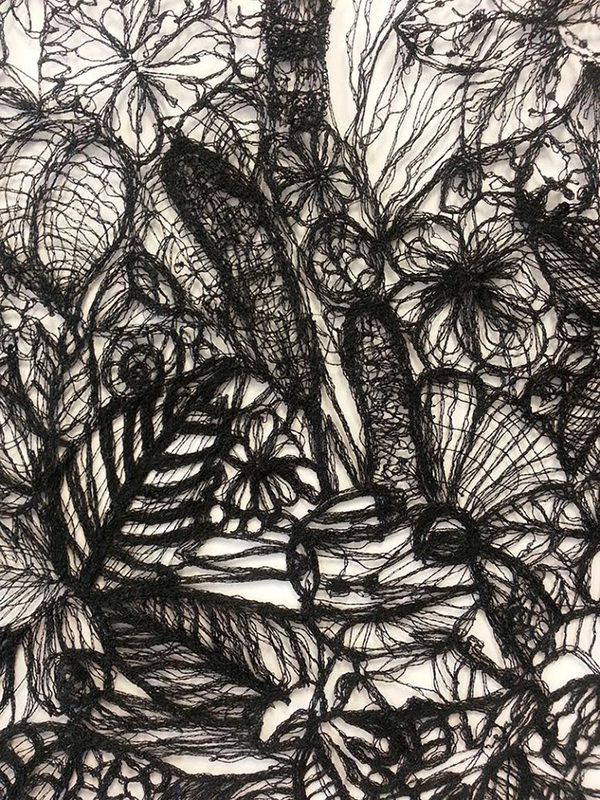 No stranger to alternative methods, this detail of a nine foot lace work shows the intricate detail the artist can achieve when she uses a sewing machine to literally draw lace. The Grand Opening of the New Studio!! Following a fire in the building of her former studio, local artist, Rachelle Gardner-Roe, relocated near UMKC and Rockhurst University to rebuild. Almost a year later, she is pleased to announce the opening of her new gallery and studio space to the public for a grand opening and open studio weekend on the second Friday of November. The inaugural exhibition, Making of Self, features textile and drawn works that explores consciousness, as well as our connection between the everyday and the sublime. Through the use of writing and lacework, the artist’s newest work utilizes traditional meditation techniques in the creation of contemplative self-portraiture, textile sculpture, and hinted landscapes. Process is integral in the creation and understanding Gardner’s work. 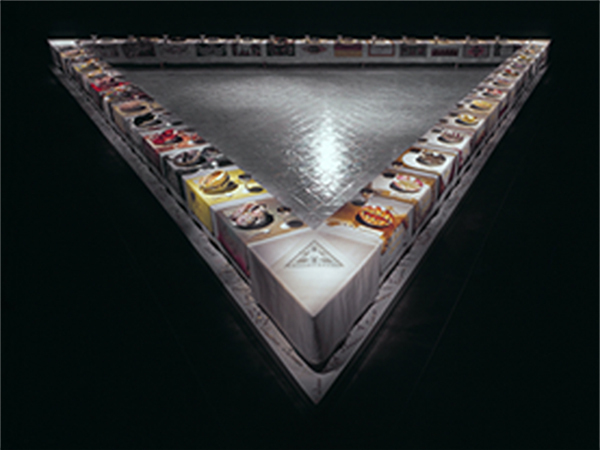 She works in various media – textiles, resin, ceramics, drawing, and painting; sometimes combining media, sometime not. Attentive to the passing down of knowledge and handcraft from one generation to another, she is especially interested in working with concepts of awareness and consciousness. Physical processes and materials become vital parts of this story. Material becomes metaphor. Process becomes transformation. Dissolving, revealing, and encapsulating become reflections of the human state in subtle form – the relationship with one’s self, others, our environment and existence. Gardner-Roe’s goal is to create work that sparks reflection and self-awareness, in the hope of advocating for compassion and a better quality of life experience for all. Rachelle Gardner-Roe grew up outside a small town south of Kansas City, Missouri. While hearing the artist’s call at an early age, she developed a knack for drafting and received her undergraduate degree in Interior Architecture from Kansas State University. She worked as a woodworking and design apprentice before inevitably being drawn back to the fine arts. As a mixed media artist, her practice includes ceramics, painting, woodworking, resin, and an emphasis on textiles. Her work has been included in international exhibitions and she continues to exhibit nationally. Among other honors, Gardner-Roe has received multiple Inspiration Grants from the ArtsKC Regional Council, Kansas City, MO; The Presidential Scholarship from The Anderson Ranch Arts Center, Snowmass Village, CO; The Urban Culture Project Residency, Kansas City, MO, and an Escape to Create Residency of Seaside, FL. Gardner-Roe resides in Mission, KS. For more information on the artist’s work, visit www.rmgardner.com.